Is your network or Wi-Fi running slow? Many different devices and apps connect to the network, and it can take just one hidden device or app to slow your network to a crawl. To get started, first install the GlassWire app for Windows. 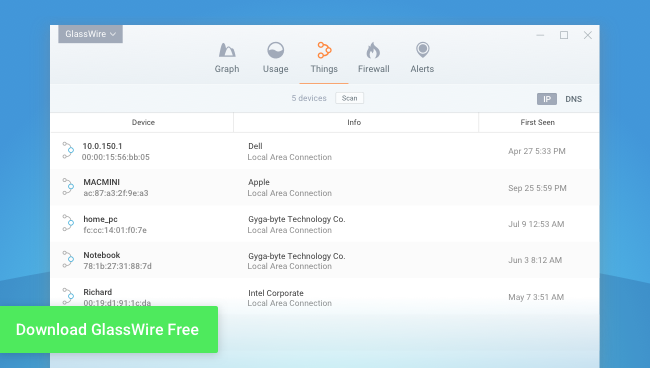 After installing GlassWire click the “Things” tab to see a list of all the devices currently on your network. You can then go to the top left GlassWire menu and choose “settings” then click “security” and then “Things monitor”. Now check the box that says “Notify me about network device activity” and select “Report only new unknown devices”. GlassWire will then let you know any time a new unknown device joins your network. See What Your PC is Connecting To in Real-Time! Could it be your desktop computers that are slowing your network to a crawl? GlassWire can tell you immediately if that’s the case. Install GlassWire on your PC, then GlassWire’s graph will begin showing you all the network activity happening on your PC. The GlassWire app will also alert you every time a “new” application accesses the network and starts using your bandwidth. Are you unhappy with a certain app that’s wasting your bandwidth? Go to GlassWire’s Firewall tab and click the fire icon next to the app you want to block. 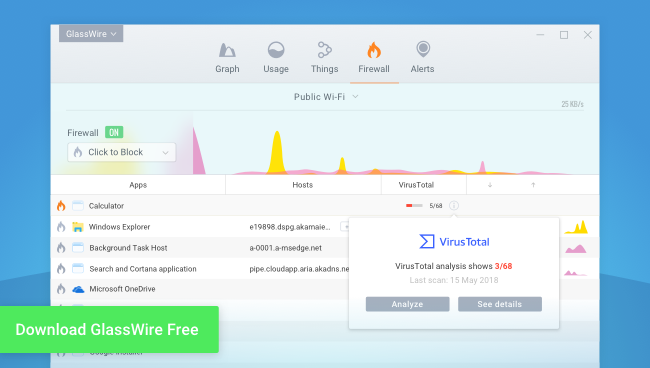 GlassWire also has the ability to scan any of your network related apps with VirusTotal to see if your PC is infected. Go to GlassWire’s settings, then click “VirusTotal” to turn on this feature. You can then go to GlassWire’s firewall tab, then mouse over the VirusTotal column to scan any apps for malware. Did you know it’s becoming more common for hackers to set up secondary fake WiFi networks for businesses to monitor and steal data from people? GlassWire can help protect you from this problem. Go to GlassWire’s settings, then click “Security”. Next click “WiFi evil twin alert”. GlassWire will then alert you if a new WiFi device joins the area that has the same name as your other WiFi devices. Please note if your WiFi uses several devices then it’s possible to get a false positive report at first, but once GlassWire learns what WiFi hardware you should be using it’ll be able to tell you if you might be connected to a dangerous fake WiFi access point. 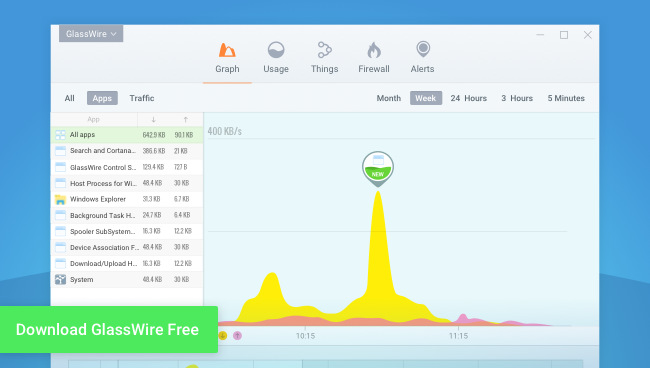 GlassWire also has a popular free app for Android that can show what’s using your WiFi and mobile data in real time! 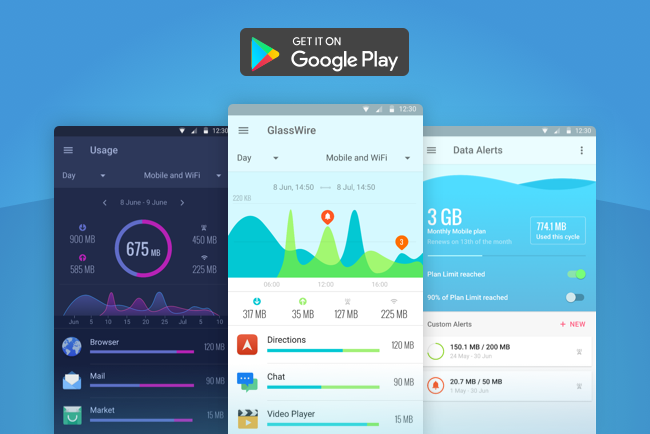 Get GlassWire for Android now FREE. 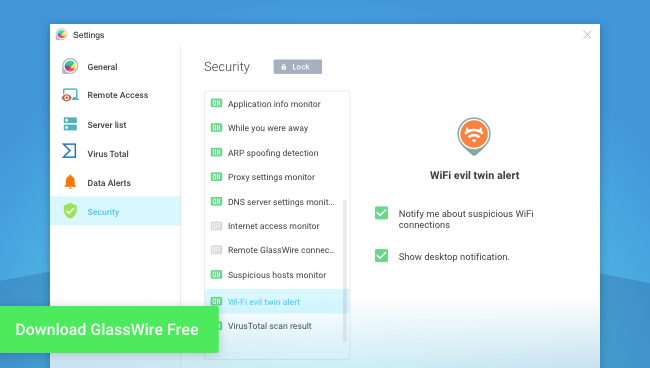 GlassWire’s free version is extremely powerful on its own, but GlassWire Pro has many more powerful features including the ability to allow or deny new connections before they happen, the ability to get alerted when a new unknown device joins your network, plus much more. Use the coupon “howtogeek” to get 25% off of GlassWire Pro today if you hurry before the offer ends!